This is my entry for this week’s Illustration Friday word of the week. The word of the week is, “capable”. For some reason, President Abraham Lincoln comes to mind when I think of that word. 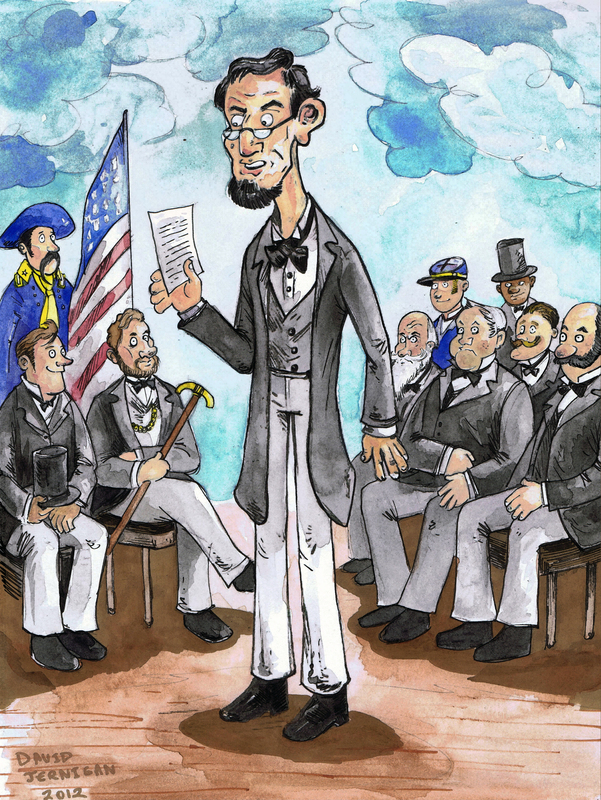 He unquestionably was capable of creating a memorable speech. 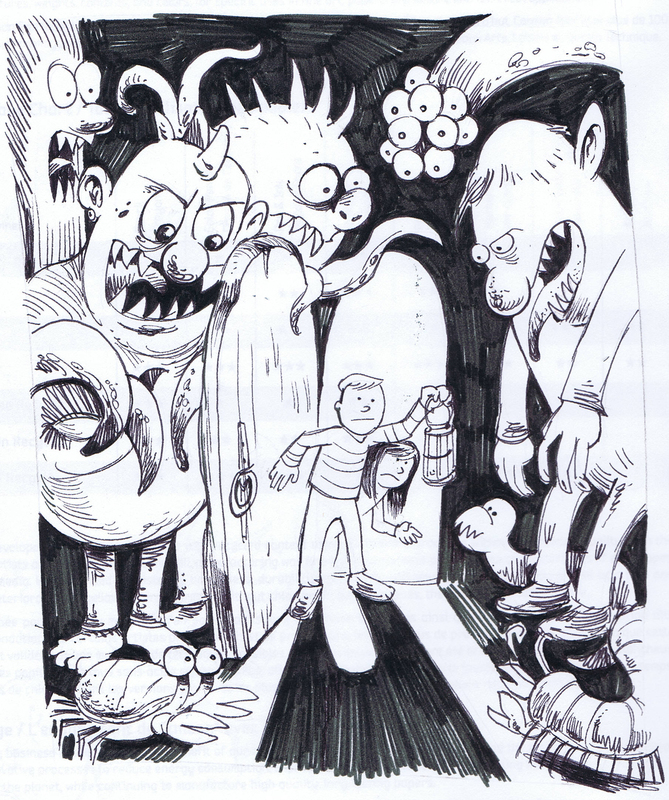 In this composition, I plagiarized freely from myself, a common practice among deadline-pressed illustrators. I used a sketch of Abraham Lincoln from an earlier drawing of mine and modified the sketch. I added the audience behind our capable 16th President. This is my entry for this week’s Illustration Friday word of the week. This is my entry for this week’s Illustration Friday word of the week. The word of the week is, “fluid”. 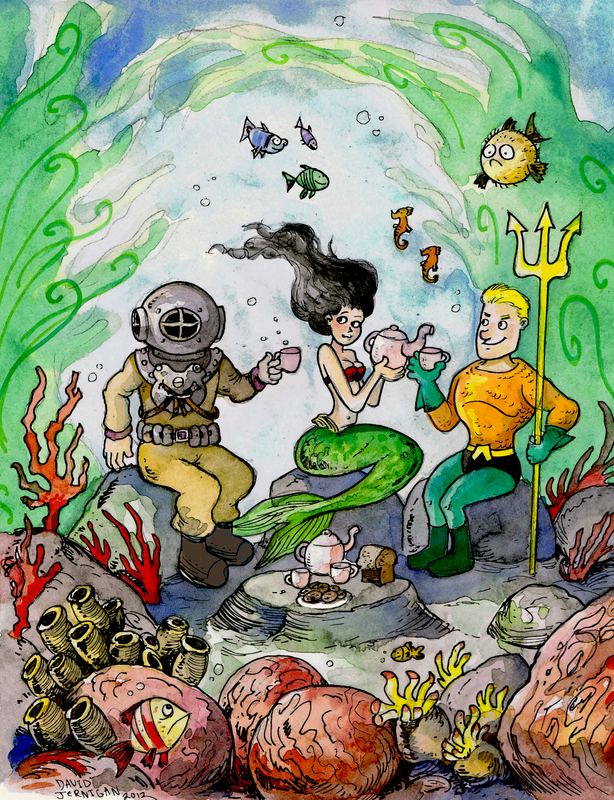 I created an underwater tea party. Included in the underwater festivities is Aquaman. I like Aquaman. He can breathe underwater and converse with fish. Aquaman was my favorite superhero when I was especially young. Here is an Aquaman fact, the amazing king of Atlantis has been around since 1941. I have a sinking suspicion that Spongebob is somehow related to him. 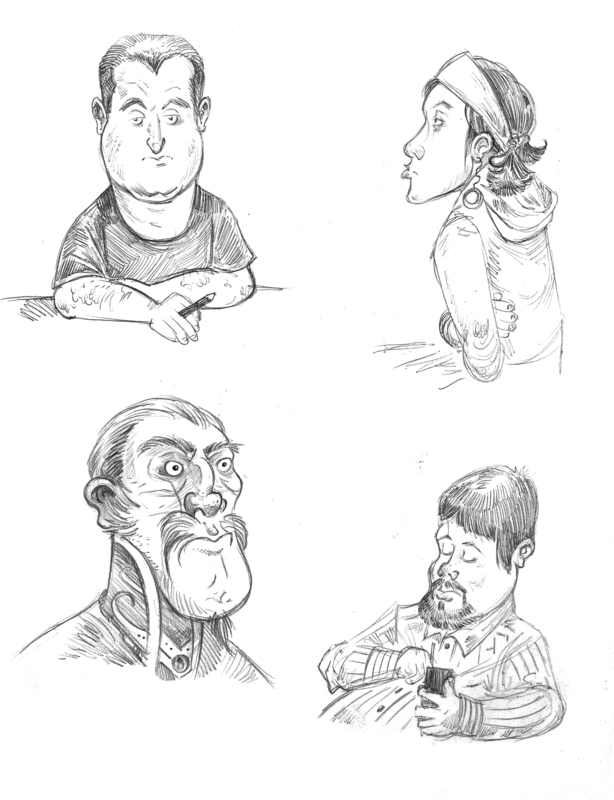 Some character sketches I created on sheets of typing paper during one of my late night teacher education classes. Started off sketching people in class and eventually made up faces after a few drawings. 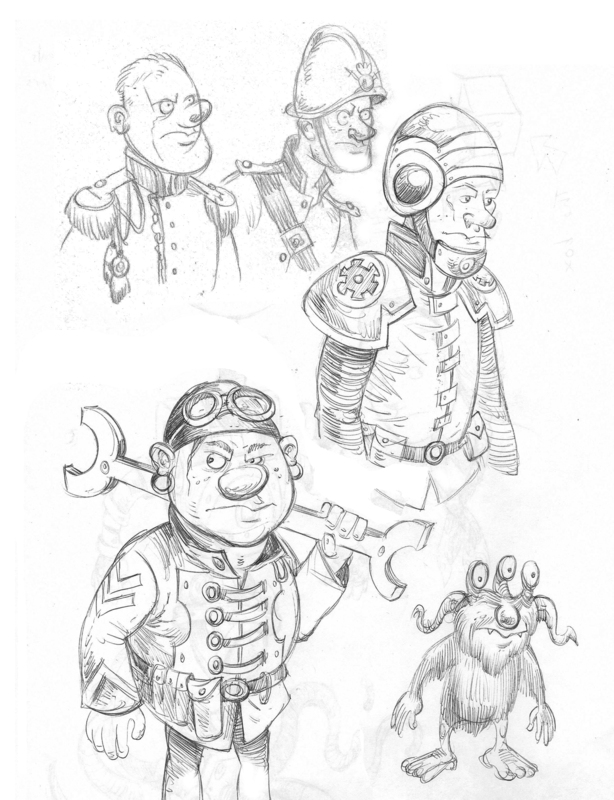 These are sketches for the unadulterated sake of sketching. 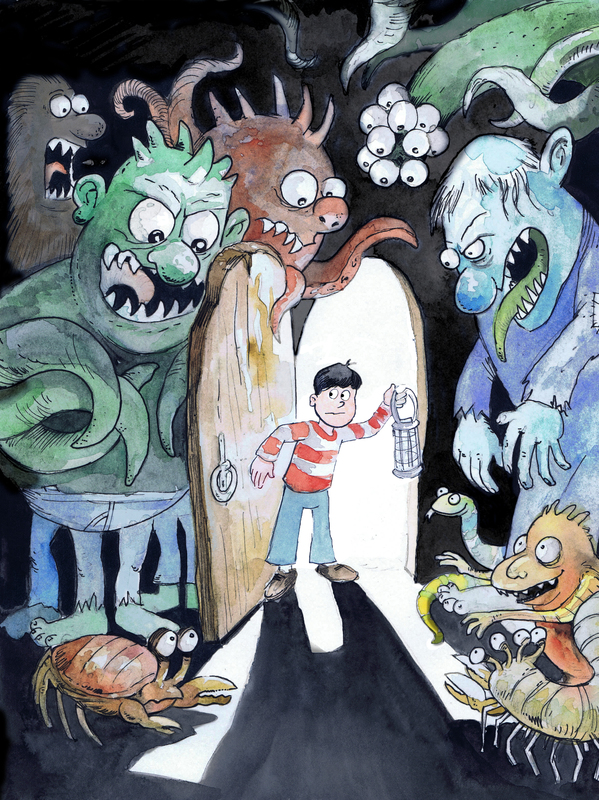 Avast me mates, here it be, me entry for this week’s Illustration Friday word o’ t’ week. T’ word o’ t’ week be popularity. 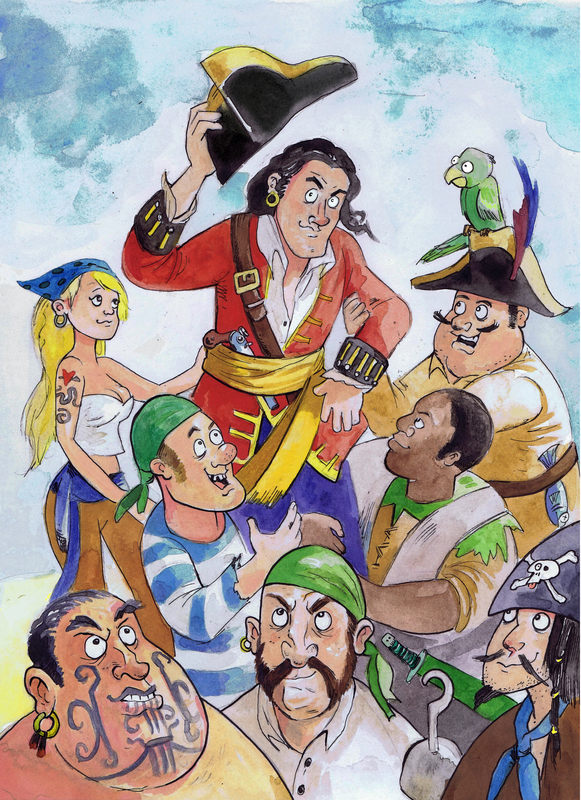 I created an illustration o’ a popular pirate captain hosted on t’ shoulders o’ his crew. Popular he be because he be such a nice pirate with such good manners. Once again, I used watercolors and some pens t’ create t’ illustration. Shiver me timbers! My computer has returned to life. It’s alive. It’s alive… It’s alive! This watercolor is yet another Illustration Friday illustration. The word of the week is, “suspense”. I included the pen and ink sketch below the final work.